Picture a scenario where you're at a Walmart, and salesperson peddling cable and high-speed internet in the store asks if you’d like to save some money. He's wearing the properly branded gear and presents an attractive offer. Then he asks you to input your social security number on a table in order to see if it qualifies for the special price on the internet package. 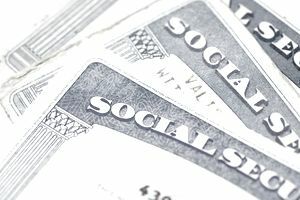 The SSN website has a lot of good resources to help prevent social security fraud – including this page that gives lots of tips to guard your social security number. To check on information about your Social Security number, always make sure you are using the official ssn website – it should have a .gov extension and not be a .com or anything else. Only official government agencies can use the .gov extension.